Mesoporous and microporous adsorbents play critical roles in gas storage and separation applications. A predictive understanding of high-pressure physisorption on a variety of adsorbents would facilitate the further development of tailored adsorbents and adsorption analysis. Prior attempts at developing a predictive understanding, however, have been hindered by nonideal gas effects. By approaching physisorption from both empirical and fundamental theoretical perspectives, EFree graduate student Max Murialdo at Caltech along with former EFree student Nick Stadie, Caltech graduate student Channing Ahn, and EFree University Partner Brent Fultz, has established a "Generalized Law of Corresponding States" for Physisorption that accounts for a number of nonideal effects. This new framework allows one to predict adsorption isotherms for a variety of classical gases from data measured with a single gas. This work represents a fundamental advance in the understanding of adsorption behavior. Corresponding conditions are met when the reduced variables of each nonideal gas are equivalent, and fractional occupancy gives the fraction of occupied adsorption sites. 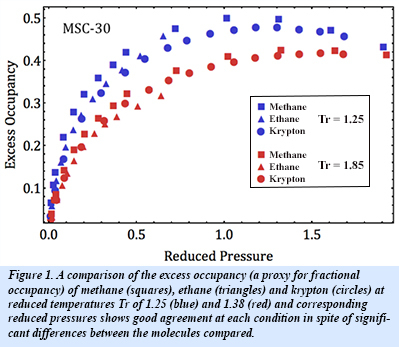 At such corresponding conditions for the same adsorbent material, the fractional occupancy of different classical adsorbed gases will be equivalent, as shown in Fig. 1. This "Law of Corresponding States for Physisorption" was determined using Langmuir, BET and Dubinin theories along with methane, ethane and krypton adsorption isotherms across a number of conditions and adsorbents. Furthermore, a model has been developed to account for recently discovered cooperative adsorbate-adsorbate interactions and shown to be consistent with this generalized law [M. Murialdo et al., J. Phys. Chem. C 120, 11847-11853 (2016)].